← The Attraction of Games: Why? I love Boromir. I know I’m not the only one who does. And however much I like Boromir when he’s alive, there’s something that’s almost even more (tragically) appealing about him dead. This is less because I like his ruggedly handsome corpse, and more because of what Homer touched on thousands of years ago: in his death, because of how he died, Boromir becomes something more than he was in life. 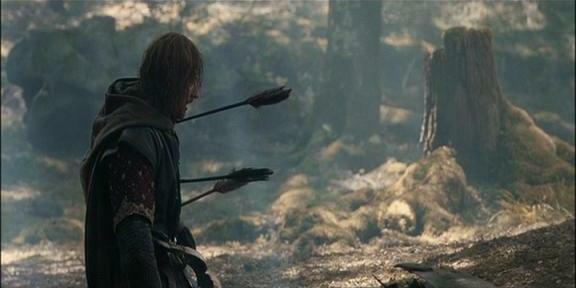 Boromir had what we might call a good death. Key to this, Boromir dies before he truly succumbs to the power of the Ring, and in his death he tries to make up for some of the mistakes that he has made previously. His act of self-sacrifice protecting the Ring-bearer is a fairly hefty weight in his favor on the scales of Judgement, making up for some of his earlier errors. Interestingly enough for such a perilous setting, he is also the only member of the Fellowship to die and stay dead. It turns out that that single heroic death is pretty standard. Most stories, like most role-playing games, don’t have lots of character death. In reality, people engaging in the same activities that most adventurers and main characters pursue with wild abandon have a fairly high casualty rate. People are killed while fighting, they’re permanently injured, they get sick… and in many cases, their deaths and debilities feel meaningless. For every handful of people that die doing something we would idolize as heroic, far more are killed or injured in an almost banal fashion. Would we feel the same way about Boromir’s death if he had, I don’t know, been killed without having a chance to fight back? Stepped on a landmine? Slipped in the shower and broken his neck? No offense intended to those who have suffered such fates, but probably not. There’s something about the concept of an appropriate or glorious death that we tend to find appealing in our stories. We like to hear that the villain got his comeuppance in a thematically appropriate fashion, or that the protagonist died performing some last act of bravery and heroism. The same goes for the deaths of our own RPG characters. Even when we know that our characters are going to die, we still want the way that they die to feel appropriate. We want our characters’ deaths to matter. Let’s talk more about RPGs: it’s funny that I should have to mention a game in which we know that our characters are going to die, isn’t it? Unless you’re playing an immortal, dying is pretty much a part of the package, right? It would be very strange for your character not to die at some point. But when we’re playing we don’t usually enter into standard adventure situations thinking, “This is probably the scene where I die.” That’s despite the fact that adventurers frequently get in running gunfights or charge large groups of well armed and armored people head on, things that should result in terrible horrible death in a fairly short period of time. Because, in reality, if you don’t get killed the first time you do it, the second or third will probably get you. Or the fourth or fifth. You get the picture. Fortunately for our characters, games are not reality. Many games are intentionally designed to allow and even promote unrealistic behavior on the part of our characters, fulfilling our expectations of cinematic stories in which swashbuckling and derring-do give our heroes a chance to do things which might range from the highly implausible to the outright impossible. We develop expectations about how the game will play out (and whether we should expect sudden and unforeshadowed death) based on our interactions with the game system and with the storyteller, and many systems and storytellers tell us that we should be audacious, aggressive, and think creatively. We are not punished for potentially stupid or risky behavior because it’s more fun to see our characters being cool, and storytellers are happy to let us get away with it. Besides which, that same behavior often sets us up for more trouble later on, which is also fun and interesting. But all of that is very different from games in which we might expect things to happen a little bit more realistically. Some games are intentionally given a very different tone: we expect that nearly anything and everything may be able to kill us, or we know that many of the things that we’ve been dealing with are exceptionally dangerous and even lethal. This sort of game encourages caution, paranoia, and planning on the part of the players, and a momentary mistake might result in a potentially fatal encounter. Case in point, I ran a crime game many years ago in which my players got used to the idea that guns were very dangerous in the course of the first session. They made enemies with some powerful people, and in one of the later sessions one of the characters (tired after being involved in a series of extremely tense negotiations and a gunfight or two) opened their front door for an assassin. The ensuing fight was intense, no holds barred, and ended up with both people going to the hospital and one of them ending up in the morgue. If my friend’s character had died my friend probably would have been sad, but he wouldn’t have felt like I had killed his PC for no reason. His character’s death might not have been good, but it would have been fitting; it was the sort of game where death is what happens when someone else gets the drop on you, or when you make a mistake. From a storyteller’s perspective, how can we make sure that the PCs’ deaths feel good or fitting? One way to do it is to play to genre expectations. Crime dramas and political intrigue games often have death and murder galore, usually at the hands of a wronged party that has just been waiting to take its shot. In these settings, making a mistake can often be lethal, and deaths are more often fitting than glorious. High fantasy and epic fantasy more often has a few very well spread out deaths, perhaps more to prove that the story is still “serious” (whatever that might mean) than to actually provide a realistic sense of the inherent risk involved in any dangerous endeavor. These deaths can happen to minor characters as well, just so long as they serve to prove their point. The Lord of the Rings is an excellent example of this. While genre is important, the game system is also critical to our understanding of whether or not the characters are at risk of imminent death. Systems like Unknown Armies or Call of Cthulhu usually make it clear that your character might die suddenly and without warning from any sort of altercation. Guns, in particular, are very scary. On the other hand, most modern versions of D&D and games like Spirit of the Century are rarely intended to be threatening: D&D specifically encourages storytellers to design combat encounters that will challenge but not murder the PCs, while SotC is designed to offer a cinematic experience, with all that that entails. Trying to make SotC or modern D&D feel dangerous and lethal often feels strange to players with previous experience of the systems. Finally, we come to something that I’ve repeated in almost every one of my other gaming articles: storytellers should discuss their expectations with the players, and everyone should come to an agreement about how dangerous (and lethal) the game may be. If you’re having trouble, talk it out with the others and figure out what the problem is. Maybe you can fix it and continue with the game that you all want to play. But where you can, make sure that death happens because it makes sense in the fiction, because it fits thematically with the story, and because it seems right to the people involved. Offer the PCs deaths that matter, and don’t try to just murder them without giving a clear indication of the risks that they are running. They should know that the knock on the door has come at an odd time, that they’re being targeted by assassins, or that the cave they’re exploring was recently the abode of a very hungry troll. If it’s a heroic high fantasy, maybe you will offer a character the chance to secure the retreat of their party at the near certain expense of their own life. When everyone knows the stakes and is on board, play it out. If the character dies, they die. If not, they pulled off the impossible and that’s awesome. First off, I think that games in which you feel your character is closer to death offer a particular brand of excitement (hard fun), and in turn often require a certain type of system and set of gaming expectations. Sometimes you and your players will want this excitement, and sometimes you won’t. Make sure you’re all on the same page, and make sure that your setting, system, and expectations all support that choice. Second, because I know I want my own characters to have deaths that matter, I want to think about how to make sure that other people feel like their characters’ deaths matter. I think this can best be done by letting players have a clear idea of the risks involved in their choices (this also fits into the first point), and looking for moments when they can really shine and take the stage in a risky situation. If you’re the storyteller, think about whether or not you would feel unhappy about having your beloved character die in the scene. Or use something like the Death Flag variant rules to let players signal when they think the stakes are high enough that they want to risk death. Give PCs the deaths their players are looking for or have agreed to, or don’t kill them off at all. Side note: Dogs in the Vineyard does some pretty cool stuff with regards to this. Because of how the system works, you’ll rarely be forced to take lethal damage without going looking for it in the first place. In addition, because of how healing and death scenes work, you’re pretty much guaranteed to have a cool story to tell about it. Extra side note: this was all intended to talk about RPGs, but much of it can be generalized to other stories as well. If you have thoughts about how and where that is true (and how and where it isn’t! ), I’d love to see them in the comments. Extra extra side note: shoot, I forgot to mention John Scalzi’s Redshirts, which is totally on topic. You should read it, it’s good. This entry was posted in Games, GMing, Roleplaying, Writing and tagged Boromir, death, John Scalzi, Player character, Redshirts, Role-playing game. Bookmark the permalink. You make it enjoyable and you still care for tto keep it wise. I can’t wait to read much more froom you. Thiss is really a wonderful website.